One way a lot of people are saving money is by ditching cable and purchasing Netflix’s streaming service for less than $10 per month and using it through their PS3 (Playstation 3).? This is a great alternative to cable for someone is trying to watch their money.? Basic cable is usually around $40 per month and you do not get many channels or variety, and you usually get No good movie channels with basic cable.? If you get a higher package it can cost you anywhere from $100 to $200 per month and this is very expensive.? So many people are switching to Netflix and paying less than $10 per month for their subscription service.? What is great about this is that if you have PS3 you can stream Netflix through the PS3 directly onto your television set.? Netflix offers movies and television shows/series.? As an example, currently offered on Netflix in the way of TV series is the entire series of Grey’s Anatomy, Married with Children, Lie to Me, The Tudors, and more.? If you wanted to buy or rent these series it would cost you much more. 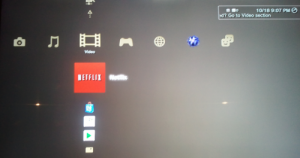 So how do you set up Netflix on your PS3?? This is easy if you are familiar with your PS3 but if you do not know your way around the PS3 here are the steps you need to follow. 1.? First, you need to create a Playstation network account (it is free).? If you already have one than move to step 2.? If you do not have one.? Turn on your PS3.? There will be a large menu board that appears.? You can scroll either left and right to find a category, or once you find a category you can scroll up and down to see the options within that category.? Scroll all the way to the right to the “Playstation Network” area and then scroll up/down to select the “Sign up for Playstation Network”.? Now create your account. 2.? Now you have a Playstation network account, scroll all the way to the right to the Playstation Network and scroll up/down to the “What’s New” section.? Within here you will see Netflix. If you do not see it here you can try the “Playstation Store” category and find it there also. 4.? Once installed, on the main menu screen of your PS3 you will scroll to the “Video” section and then scroll down to the Netflix icon. 5.? Select that icon by hitting the “X” button and you are ready to begin.? It will ask you to sign into your Playstation Network account, and once you do Netflix will load on your PS3. 6.? Now you can scroll up and down, left and right within Netflix to find movies or TV shows to watch.? You can add them to your Que if you want in case you find a lot you want to watch but don’t want to have to remember them all.? And you’re all set to begin watching Netflix streaming on your PS3. Thankyou SOOO much! I am computer illiterate and your instructions were so easy! THANKYOU!!! You can Sarah. The only problem is that mobile data tends to be more expensive and depending on the stream quality, can use a lot of data. For this reason an uncapped connection is usually favored.